Those bright orange stickers attached to fresh produce can tell you more about the food than you think. The four to five digit labels, called Price Look-Up codes (PLUs), are used worldwide to help stores track inventory and scan prices at checkout. Some stores create their own "retailer assigned codes," but most labels are the same across the board. You'll spot them on items sold by weight or individually, like an apple or greens. However, the labels aren't just for grocers. Consumers can use them to tell where the food came from, so if they're averse to genetically modified food, they'll know not to pick it up, according to the U.S. Department of Agriculture. 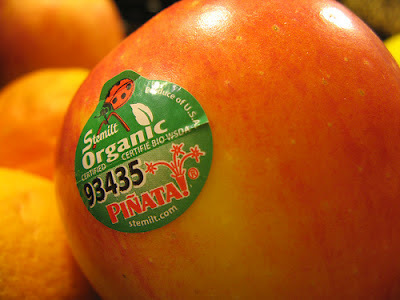 The labels will also help shoppers spot the difference between fruits like Fuji and Gala apples. What gets a label: All produce, including fruits, vegetables, dried fruit, herbs and nuts. Conventionally-grown fruit: These four-digit numbers run the gamut from guava to kiwi. For example, guava is 4299 and a banana is 4011. You can also search PLU codes online. Organically-grown fruit: This produce has five digit labels that start with the number 9. An organically-grown banana would be 94011. Genetically modified food: These five digit labels start with an 8, so a genetically engineered vine ripe tomato would be 84805.